More than thirty years after Yngwie Malmsteen exploded onto the stage with his solo career, the effects of said explosion are still rippling throughout the metal world. 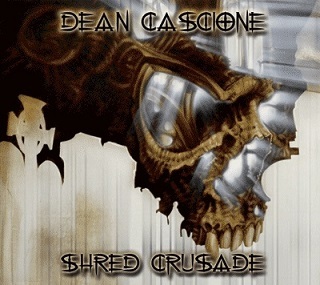 And our current case study is Dean Cascione, who has shredded out three full length albums over the last decade, all paying homage to the great Swedish godfather who started the whole thing. Cascione’s project is a small, independent one but he still managed to put together a decent band as well as get a few folks like David Shankle, Joe Stump, and Dave Mercado to join him in the studio for a few of the tracks. If you’re at all familiar with neo-classical guitarists, nothing on this album will surprise you in terms of style. Cascione’s style strongly borrows from that of his predecessors, and he uses the techniques typical of shredders to get that Baroque-infused sound to be laced loosely through the thousands of notes he hammers out over the course of his melodies and solos. There is nothing earth-shattering going on here in terms of his compositions. Like a lot of the guys who have mastered this style, he likes to hang comfortably around his harmonic minor scales whilst ripping, tapping, shredding, hammering, or whatever speed-demon technique he happens to be using. But I don’t want to put his technique down; he has some serious chops and he uses them well. The way he rips out phrases in “Rune Stone” is impressive and tasteful at the same time. And I don’t even know what in the world is going on for the last half of “Spider Gates”; I would have to physically see him play this to even have a grasp of how he is pulling off so many notes at once. I think even the aging Malmsteen might do a double take if he heard this track. But at the end of the day, you either like Bach with blast beats or you don’t. And if you don’t, well, Cascione isn’t offering anything new that will change your mind. The main flaw with this album is the production. It feels like it could have been mastered better and the guitar tone tweaked a bit to give a fuller sound. As it is now, there are portions that sound hollow and empty where a thicker and heavier bottom end would really have helped bring out the music better. Perhaps with a bigger recording budget I could see Cascione’s works really shine and that would place his works right up with those of the legends who preceeded him. His compositions are certainly solid enough; it’s a shame that the album’s sound suffers so much because of a lack of studio finesse. For those of you who enjoy this style of neo-classical shredding, definitely check this one out. Perhaps with a better budget down the road, we could see a real classic come out of it.